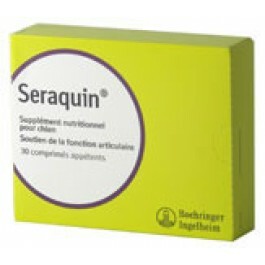 Being so palatable, Seraquin is easy to give. 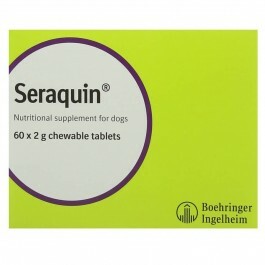 Most dogs love Seraquin chewable tablets and will take the tablet willingly from the hand. You can give them as a treat or crush them onto their normal food. 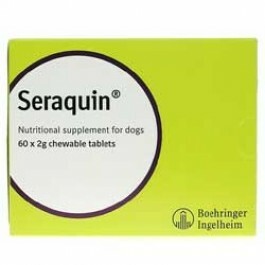 Seraquin tablets are very palatable and spontaneously accepted by most dogs, however they may also be crushed and added to the food. Joint problems can occur over a period of time. Being overweight can put extra strain on your dog’s joints so keeping his/her weight down is helpful. If your dog is overweight ask your vet for help in planning a weight reduction programme. Bear in mind that if your dog has poor joints you may not succeed in getting your dog to ‘walk off’ any excess food intake, so a reduction in food is usually necessary. Regular, gentle exercise is a real help as it helps prevent the joints from stiffening up and maintains mobility so your dog can remain active. Your vet can help you work out the most suitable exercise schedule for your particular dog. The steps you can take to support your dog’s joints will vary according to their age and health status. Your veterinary surgeon will be best placed to advise you on the options.